There are some good really good buffets on the Strip Bellagio is amazing, Cravings at Mirage is stunning and probably represents the best value, Mandalay Bay is home to my personal favorite, but the Las Vegas buffet crown now goes to Wynn and best of all with a little cunning you can sample this for free. 4. Put $40 in the machine and activate your free play. 5. Repeat step 4 six more times. 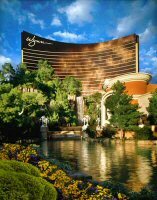 Click for the best Vegas Deals, Travel agents will not show you these !! This doesn’t work. Just tried a few days ago, and the minimum points needed is 150 for two free buffets. (there is no tier for one buffet) The video roulette games do not have 00 (or 0, forgot which), so you only lose $1 for each time you play this way (hedging at $18/18/1). If you play about 30 times or so (losing ~ $30), you should be able to earn 150 points, which works out to about $15/person for the buffet, which is still a fair deal if you have the time. When you sign up for the card, you get to spin a (virtual) wheel for a prize, the least of which is a $10 slot credit. We didn’t bother actually playing for the $15 buffet, as we were in a bit of a rush. But with a $10 credit, and playing through that back to an even $40, it would’ve needed another 30 dollars/plays to earn 150.